Readers - Despite my alleged cartoon on Wednesday, it's become clear that I can't really juggle politics and important personal challenges at the same time: my family comes first. So I'll drop back to my previous message: I might post from time to time, but I can't make any promises. Those of you with computer reminder programs, Post-it notes, or an open-minded nature about a really unusual tattoo might want to write "check to see if Hope n' Change is back" and drop by this page every so often. Alternately, go to the new MAILING LIST BUTTON at the top left and enter your email address, and I'll let you know when things are back to normalish. I will not spam you, or turn over your address to the Gestapo. Johnny Optimism will keep rolling along (get it?) but I may not always be able to respond to comments in a timely way. Again, thanks for your support - it means a lot. Despite the severe budget sequester which is, according to Debbie Wasserman Schultz, forcing young Washington staffers to starve because they can't afford meals on their pitiful $60,000-$160,000 salaries, Barack Obama has still managed to cobble together the money to send his family on yet another luxurious, first-class five-star vacation to help take their minds off of the fact that they haven't visited Hawaii for weeks now. The First Daughters are said to be vacationing in the luxury "Atlantis" resort in the Bahamas, which seems appropriate since their dad has had our finances underwater so long. And while there's nothing wrong with the girls having a little fun, it does seem pretty tacky to rub Americans' noses in the Obamas' conspicuous wealth (and willingness to also use taxpayer money) while the Whitehouse itself is closed to the young paupers and working-class riff-raff who had hoped to visit during their own spring breaks. Now, sadly, all those kids can do is visit the Supreme Court and listen to people protesting about Gay marriage while wondering why all the Supremes, male and female, are wearing dresses. Frankly, Hope n' Change would like to see those kids get a clearer look at how our government really works. With the first family not around to require expensive Secret Service protection, why not let kids actually tour the Whitehouse and ask why, during times of extreme crisis, there's nobody on the job?! 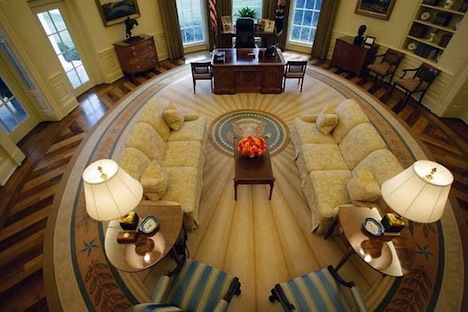 What could be more fun than letting kids hear real echos in the empty Oval Office? !